Energy efficiency plays a key role in helping manufacturers produce product at a designated quality, safely, for the least amount of money. Learn how to conduct an energy analysis at your plant and the resources available through the U.S. Dept. of Energy to help achieve your energy efficiency goals. Other topics in this issue include turndown in moving-valve trays and job hazard analysis. Clean Water: What is it Worth? Shopping for an appliance, for instance, a microwave, is a familiar task. How you shop for that microwave, however, is distinctly different in 2018 than it was in, say, 1998. In 1998, you would have visited your local appliance retailer and purchased the model that fit your needs and budget. Perhaps you would have visited a few other locations to compare prices and features. In 2018, your first stop is probably your internet browser, where you toggle between practically innumerable tabs in your pursuit of the best deal. Why pay more for the same thing? You want the lowest possible price, using the least effort, to get the best microwave. Your goal is efficiency — doing more with less. The same is true of an industrial process. The U.S. Dept. 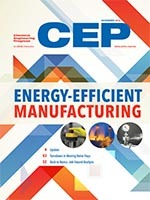 of Energy’s Better Plants program provides technical assistance, training, software, and tools to help manufactures improve their energy performance. At turndown, the efficiency of two-pass moving-valve trays may be lower than expected due to maldistribution of the vapor within the trays. This article explores this maldistribution and describes ways to alleviate it. Fatima Ibrahim, Jeremy Lebowitz, P.E. Job hazard analyses require employees and employers to think critically about the dangers of a work environment and prepare operators for the unexpected.